With the rise in security consciousness comes the rise in cheap replica security systems . We’ve all seen the ads online, ‘New HD wireless infrared CCTV camera!! ONLY $40 with free delivery!!’. As much as you might be drawn in with these bargain prices and eye-catching headlines. It is important to look at the dangers of dodgy security systems. You need to weigh up your options with all of the facts in minds. You know that if a deal looks too good to be true, then it usually is, right? This is true about replica systems too. Don’t just take our word for it though, check out our mate’s story below. Our friend John ordered a six-piece wireless CCTV set off a popular marketplace here in New Zealand, after finding tools missing from his shed. The set claimed to be everything he was looking for.‘ High quality’, ‘new’, ‘waterproof’ and ‘recommended’. Online the set looked professional and seemed to tick all of the right boxes. After fumbling through the set-up, all looked good. Until a light shower that evening. Two of the cameras overlooking the driveaway lost their connection. They had been damaged by the rainwater and would no longer turn on. Funnily enough, there was no after sales service or warranty on this set. A few weeks later John awoke to find his shed door forced open and more tools missing. After checking the cameras, he noticed that they had stopped recording altogether. No footage was filmed nor saved and the burglars had got away with it, again. Often, the bad far outweighs the good when it comes to these budget home systems. Not only is your security compromised, but your insurance claims can suffer too. 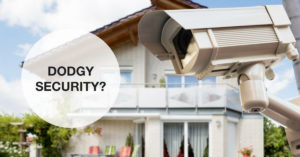 When applying for home and contents insurance having security systems installed may help to bring down your premiums. The difference lies when you come to make a claim and these cheap systems have failed to do their job. Your claim can be denied if your CCTV failed to record or your alarm failed to alert. Rendering your insurance useless, like in our mate John’s case. A good professional security system doesn’t need to cost thousands of dollars and will ensure your home, contents, and family are properly protected. Don’t make the same mistake John did. If you’re ready to make the change towards a safer home, call us on 027 578 1298 to see how we can help.